1. 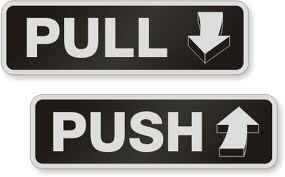 Print and tape Push & Pull door signs on the wrong doors. 2. Find a spool of thread that matches your shirt and hide it in your pocket. Leave a length of thread hanging out. Your victim will see it and try to pull it out. It will keep coming and coming! 3. Use the glass "shade" from a tea candle lamp--the kind that is shaped like a bowl with a hole in the bottom (or just cut a hole in a plastic bowl). Place it on the victim's desk and fill it with small candies. You can put a floral card holder in it with a nice note attached. 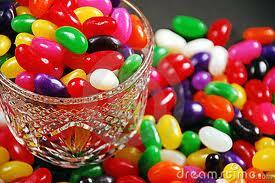 When they lift the bowl, the jelly beans will pour out through the hole in the bottom and go all over the place. 4. 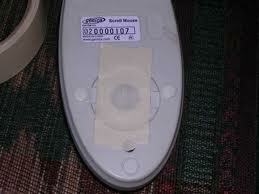 Computer mouse prank- place tape under mouse sensor. 1. Tape a strong magnet onto the bottom of a drink mug and stick on the top of your car. Drive around and laugh at the people trying to get your attention! 2. Cranked up! Get into victim's car while they're away, turn winshield wipers on, crank up the music tuned to some loud & annoying station you know they'll hate, bring the seat in, turn AC on full blast, you get the picture. 3. Stuff some jeans and create fake legs with shoes attached. Shut your trunk with them hanging out! You'll definitely turn some heads! 4. Put some bubble wrap (the kind with the BIG bubbles in it) in front of or behind the tires of the victim's car. When they back out of their parking space a large pop will be heard, and then he/she will wonder what they hit. 5. Graffiti Fraud- Cover the hood of your victim's car with plastic wrap, tucking the edges under the hood so it's invisible. Then paint graffiti on the plastic with acrylic paints. Hide nearby so you can see your victim's face when they see the "damage." 6. Animal Cruelty- Attach an old leash to the back bumper of the victim's car. Attach a collar to the leash so it drags on the ground. If you want you can put the collar around a stuffed animal. Hopefully, you can ride along and watch the reaction of the other drivers on the road! A red solo cup upside down on desk filled with bb's. 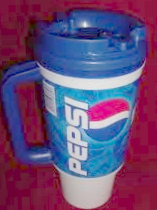 (Fill the cup with the bb's. PLace cardstock on top and carefully flip over and place on desk. Carefully slide cardstock out). When they lift the cup, bb's will go everywhere. Also, you can wrap each individual item in the office with foil! What a surprise they will come in to at work. Saw both of these done to a friend recently. I've never done the grafetti one, but we have used an industrial roll of plastic wrap to wrap my sister-in-laws car. Since my husband works til 1am he just dropped by and wrapped the car before coming home while everyone else was sleeping. Bumper to bumper. Love your work prank suggestions, thanks. A co-worker and I once, taped down our office manager's phone receiver to it's cradle, linked her often used paper clips end to end. We also moved all of the items on the right side of her desk to the left and vice versa. We of course did after our victim left for the day prior to April Fool's. We put hand sanitizer on the phone receiver. Then call the extension. That stuff is always cold! Well here's another prank you can replace manoayes with vinilla pudding.take popcorc( small tooth like and dip it in gloss. Add some brown paint and food for tooth.take a piece of garbage bag and stretch it over tooth to make black tooth. Spray paint it gold for gold tooth. for work place pranks...a few years ago, I spent several days photocopying paperclips. stashed the paper in my desk, then early in the morning, I placed all the paperclip paper in the copier. As people made copies, they thought there was a paperclip stuck in the copier. The IT guy even began to dismantle the machine, until I went over and opened the paper drawer. It was priceless!! !